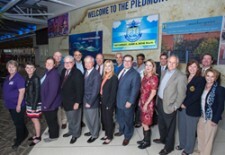 Association Management Group Execs to Co-chair 2016 PTI Runway Race | Company Newsroom of Association Management Group, Inc.
April 19, 2016	(Press Release) - Paul and May Gayle Mengert, founders of Association Management Group (AMG), one of the Carolinas' largest professional homeowner association (HOA) managers, were recently named co-chairs of Greensboro's 7th Annual PTI 5K 10K on the Runway at Piedmont Triad International Airport in June. AMG participated in last year's race as a sponsor and fielded a race team. This year's June 4 race on the airport runway benefits Greensboro Urban Ministry and Open Door Ministry, as part of Second Harvest Food Bank of Northwest NC in their efforts to end hunger through education, outreach and advocacy. "This race is always a great day of camaraderie and fun, service and support" said race co-chair Paul Mengert, AMG President, commercial pilot and PTI Airport Director and Treasurer. "AMG is in the community-building business and committed to creating safe, healthy, attractive neighborhoods. That's what these nonprofits do too: They help create healthy communities by ensuring neighborhood families get the food they need to live productive lives. It's a good match for our company." As co-chairs, the Mengerts have set an aggressive goal of raising $100,000 for the local food banks. "AMG and our corporate partners are committed to helping those most in need," said co-chair May Gayle Mengert, VP of AMG. "While the economy has improved for some, those most in need are still suffering a great deal. We are pleased to join with many of our business colleagues to make a real difference." Paul Mengert, AMG President, added that PTI, often considered an economic engine for the Triad, is a logical centerpiece for the race. "It is important that this engine also help provide for homeless families in the Triad," he stated. Members of the race committee include: Cheryl Ledford, Greensboro Urban Ministry; Debbie Clark, Second Harvest Food Bank; Lea Metz, Second Harvest Food Bank; Clyde Fitzgerald, Second Harvest Food Bank; Steve Showfety, Chairman, Piedmont Triad Airport Authority; Jo Sanderlin, WKRR/WKZL; Ron Miller, Consultant RMA; Stephanie Freeman, Marketing and Customer Relations; Piedmont Triad Airport Authority, Doreann Smith; Director of Finance and Administration, Piedmont Triad Airport Authority; Steve Key, Open Door Ministries; Drew Hancock, Board Member Piedmont Triad Airport Authority; Don Webb, Vice Chair, Piedmont Triad Airport Authority; Scott Bassett, On the Mark Sports; Leslie Graham, Open Door Ministries; Jim Himes, WGHP Fox 8; and Kevin Baker, Executive Director, Piedmont Triad Airport Authority. Good corporate citizenship is an integral part of the company culture at AMG's five HOA management offices throughout North Carolina and South Carolina. AMG boasts 100% community service as an organization: both the company as an entity and the staff donate time as well as make financial and other contributions. Along with the PTI Run, AMG is also supporting the late May Dirty Girl Run, a women-only mud run for cancer education, with a sponsorship and a team. Along with the road races, the Mengerts are involved with the Guilford County Board of Visitors, Angel Flight Soars, Lutheran Family Services, Bahamas Habitat and Rebuild Globally. Paul Mengert served on the US board of Givat Haviva Educational Foundation, one of the oldest and largest Middle East peace education institutions, and was part of the board that won a UNESCO Prize for Peace Education. "AMG understands the need to support local charities," said May Gayle Mengert. "Last year, the PTI Run collected an impressive 2173 pounds of food and raised more than $40,000. Thanks to our outstanding race committee, we look forward to even greater success this year." The race committee is currently recruiting sponsors. For more about sponsorship, email freemans(at)gsoair.org.